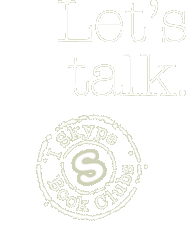 I love to talk with book clubs — either in person, when possible, or by skype or phone. I don't charge for visits, but I do ask that members read the book (or at least the book jacket!) and, if it's financially feasible, purchase their e-books and/or print copies. I'm happy to sign books or send signed book plates. I thoroughly enjoy an open, lively discussion, so bring on the questions, opinions, and insights!